The other day my wife and I were talking about taking a long vacation and I drifted off thinking about my fish. Who’s going to care for and feed my fish while I’m on vacation? Which got me thinking about how unprepared most fish keepers are for a vacation, a pet sitter is not something we immediately think of. I usually like to have a friend or family member look after my fish while I’m gone. But what if you don’t have someone you can depend on. Well, we thought about the same thing and got in touch with a few people who know a few things about pet sitting. I hope you enjoy this post which has been provided by Pet Sitters International. You’ve selected a vacation destination, marked down your preferred dates and made a checklist of the steps you need to take to finalize your vacation plans. As a fish owner, there is one important question that you must include on that list: Who is going to watch over your aquarium while you’re away from home? Selecting a professional pet sitter—someone who is trained in pet care has liability insurance, provides client references, etc.—can provide you with the peace of mind that your aquarium and fish are in good hands while you’re away. But since the pet-services industry is often depicted as very cat- and dog-focused, you may wonder who you can rely on for your fish-care needs. Here’s the good news: Aquarium owners have more options than ever before. The 2018 State of the Industry Survey by Pet Sitters International (PSI), the world’s largest educational association for professional pet sitters, revealed that the majority of professional pet sitters now offer care for fish. PSI found in its 2018 survey that 82.7 percent of the responding PSI members offer care for fish, compared to 60.9 percent in 2016. But when conducting the search for a pet sitter to take care of your aquarium while you’re away, how do you know that you are selecting a true professional? PSI encourages all pet owners—regardless of the type of pet they own—to conduct an in-your-home meeting with any potential pet sitter so you can meet them in person and review their services and policies. Does the pet sitter have the proper business license for your city or state, if required? Is the pet sitter a Certified Professional Pet Sitter (CPPS®) and/or has he or she participated in other pet-care training, such as pet first aid? Is the pet sitter a member of a professional and educational association, such as Pet Sitters International? As a fish owner, you should also ask the pet sitter if they have experience caring for an aquarium of your particular size or the specific types of fish you own, but even if the professional pet sitter’s answer is no, you may still decide to book services based on the pet sitter’s reputation, level of experience and training in the pet-care industry. Professional pet sitters typically adapt quickly when given detailed instructions, and if desired, you can ask if they are willing to do a “trial run” before the actual services are needed. Having an in-person meeting at your home—also known as a “meet and greet” or initial consultation—will also give the pet sitter the opportunity to view your aquarium set-up and document your specific care instructions. When meeting with the pet sitter you decide to use, be sure to provide detailed information, including your typical care routine for your fish and aquarium. The pet sitter should document all details and instructions you provide, from the number and species of fish in the tank to how often they should be fed and any medications or water treatments that are needed. The pet sitter also needs specific details about the tank, such as cleaning instructions and the desired tank temperature and lighting. Inform the pet sitter of how often the water should be tested and where supplies are located. Another important topic to discuss with your pet sitter is what to do in the event of a sick fish. Be sure to tell the pet sitter how your fish should be handled if necessary and if you have a quarantine tank. 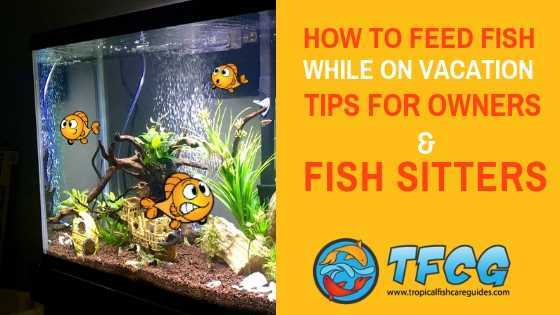 If you desire the pet sitter to take any sick fish to the veterinarian, let them know your preferred aquatic veterinarian and provide written permission for the pet sitter to seek emergency treatment for the fish if needed. Before leaving town, you should inform your veterinarian of the pet sitter who will be caring for your fish, in case their services are needed. Finding a fish sitter you trust gives you peace of mind and allows you to enjoy your vacation, so don’t delay the search for a pet sitter. Many professional pet sitters get booked well in advance of busy summer weeks or holidays. If your preferred pet sitter is already booked, or the pet sitter you reach out to doesn’t service aquariums, ask them for a recommendation of another local professional pet sitter who offers services for fish. Most professional pet sitters are happy to provide referrals when their schedules are full or their services are not the right fit. Fish owners also can visit www.petsit.com/locate to search for a professional pet sitter in their area or to download a free Pet-Sitter Interview Checklist.